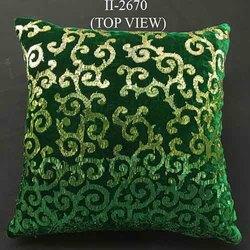 Exporter of a wide range of products which include embroidery services for pillow. Embroidery Services for Pillow come with beautiful multicolored embroidery finish and other supporting work finish which make these preferred choice of the customers. We make them available in rich, alluring color choices as well as per latest design trend options. Some of its features include tempting designs, highly attractive and presentable finish, offers longer service life, elegant in looks, choice of amazing color patterns, offered in different sizes.